Beverly Hills, the wealthiest and most glamorous part of Los Angeles, is world-renowned for its fine hotels, where keeping your cool while celebrity-spotting is an art. Some honeymoon couples and visitors on a romantic vacation check into Beverly Hills hotels to shop on Rodeo Drive, others to rub elbows with Hollywood glitterati and still others to re-live scenes from Pretty Woman. The best reason of all to visit one of these Beverly Hills hotels is to experience the ultimate in pampering and live like a star in an atmosphere of wealth and privilege... if only for a few days. Favored by the really rich and extremely famous (who don't necessarily need or want to be in the spotlight full time) the Peninsula is one of the most elegant hotels in Beverly Hills. Thanks to its sophisticated atmosphere and superior service, the Peninsula has earned both AAA Five-Diamond and Mobil Five-Star distinctions. The Beverly Hilton Hotel recently completed a $60 million renovation. Its legendary Aqua Star Pool remains the largest in Beverly Hills. Three-quarters of the guest rooms feature a private terrace. While the Beverly Hilton is in walking distance of Rodeo Drive, it's one of the hotels that offers free town car service to destinations within three miles (which can help when you're carrying all those packages back to your room). One of the poshest hotels in Beverly Hills, the Beverly Wilshire, a Four Seasons hotel, is designed in Italian Renaissance style with French neoclassic accents. Ultra-spacious guest rooms are a blend of luxury and 21st-century technology. Scenes from the film Pretty Woman were filmed at The Beverly Wilshire. 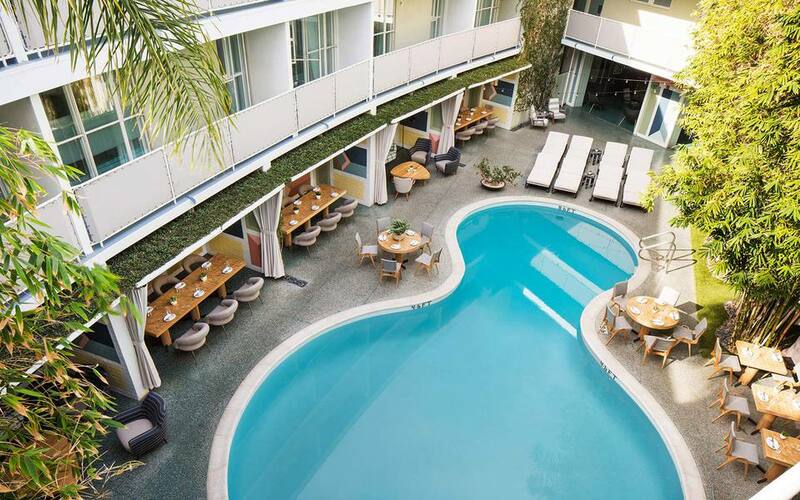 Avalon Hotel in the heart of Beverly Hills was originally built in 1949 and refurbished in 1999, keeping its mid-century modern appeal. Their new poolside restaurant, Viviane, has an eclectic menu paired with a boutique wine list and 1950s inspired seasonal cocktails. Formerly under the Raffles brand, this landmark hotel, which has been honored with both Mobil Five-Star and AAA Five-Diamond awards, has been reflagged as a Viceroy property. Here guests enjoy a blend of high-tech amenities with Zen-like tranquility. Quarters feature a 40" screen TV, Bose speakers, CD and DVD players with complimentary library, Web TV, plain paper copier-printer-scanner-fax machine and four multi-line telephones including a direct-dial private number. Costing less that most Beverly Hills hotels without sacrificing style, the Mosaic is a 49-room boutique hotel steps away from Rodeo Drive. All rooms and suites provide free DSL, two phones, a CD player, full-size body pillow, Bulgari bath products and Frette robes. A fusion of French- and Chinese-inspired design, Maison 140 represents affordable luxury in Beverly Hills hotels. Before retiring to your one-of-a-kind Mandarin or Parisian-style room, sip pomegranate martinis by the hotel's vintage, hourglass-shaped pool. You may decide it's worth paying a little more to sleep in one of the more spacious Mandarin rooms' custom-made king-size beds. Designed to resemble a mod hideway, The Crescent is a favorite spot for the younger Rodeo Drive crowd. Minimalist rooms offer maximum entertainment, including an iPod music minibar, still-wrapped CDs that no one else has heard yet, obscure magazines that no one has read before and a flat-screen TV. Each room is decorated differently yet conforms to the requisite hipness of all Beverly Hills hotels. Tops in romance: Dining by the outdoor fireplace at Boé restaurant. Legendary among Beverly Hills hotels, this eponymous retreat overlooking famed Sunset Boulevard has welcomed royalty and stars since its 1912 opening. To accommodate dealmakers and those who want to act like them, the five-star pink palace's pool is heated and even has underwater music. It's surrounded by eleven private cabanas that contain TVs, phones and fax machines. Indoors or outdoors, the Polo Lounge remains a favorite with Hollywood luminaries. The less formal, retro-style Fountain Coffee Room serves '50s specialities.